"Design a wedding dress with minimal drawing skills!" You are ready to design a dress for your wedding! Perhaps you want to design a wedding dress that is unique. Do you find you like a combination of two or more dresses? But how am I going to let the dressmaker know what I want because . . . I cant draw very well? you may ask yourself. If this is your problem . . . then you are at the right place to get help. This first method involves very little drawing. Because you use bridal gown pictures that are arranged into what I call the picture collage method. This method is a good way to organize pictures of wedding dresses you may be collecting to take to the bridal shop. This will help the shop consultant know exactly what you are looking for. "The above picture illustrates how to put together your design collage." Find a wedding gown picture with the basic silhouette you like such as: a-line, princess line, ball gown, empire waist and sheath silhouettes for your wedding dress. This is the most prominent part of any dress. Pull bridal gown pictures that have the design details you like. You might like the bodice and/or neckline of one dress and the back of another. May be you see sleeves or details like a sash, beading lace. Maybe you like the train off of another dress. If you have small changes to a gown you wont need to do a collage. If your have several changes---cut out the design detail parts that you want from the other wedding dress pictures and arrange them on paper by taping or gluing them down. Now label them with notes if additional information is needed. You can draw in free hand some simple changes---like necklines or delete straps. 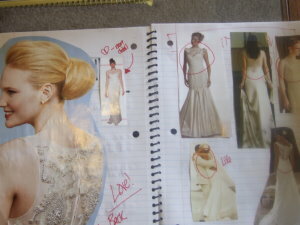 Some brides will cut out pictures of bridal gown designs and layer them over each other. For example: You can cut out the bodice---upper torso to waist---section of dress. Then from the waist down cut out the skirt of the gown. Put the bodice and the skirt over top of each other, to create one dress. Now you can contact a wedding dress maker. Talk to her about your ideas. Email or take your pictures to her of the bridal gown design that you put together. Taking the time to design a wedding dress using this method will more accurately convey you ideas you others. This is better than taking in a hand full of pictures into a dressmaker or a consultant and expect them to decipher your ideas. In the case of the dressmaker it will help her to interpret your design reducing the opportunity for mistakes. "I had a bride recently do something I thought was a neat idea!" 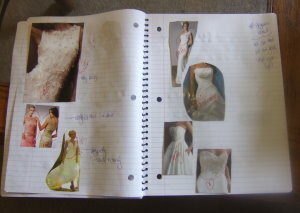 She placed pictures of wedding gowns she cut out in a photo album. She had cut out different skirt designs and necklines and labeled what she liked. She use the kind of photo album with the sticky pages where you lift up the clear plastic cover sheet and place your pictures on the tacky surface. "The album really organized her pictures in a way that help me get a clear picture of what she wanted made." This also made it easier for her to keep up with her ideas. How can I see all the details together as one dress? Using pictures of wedding gowns when designing a bridal dress is a good method to use when re-designing only one or two areas. Most new or used bridal dresses can be restyled. You can add or change something about any bridal gown design. But what if for example . . . you might like the neckline of one dress, the bodice front of another, the back of another, the sleeve off another, the train and/or skirt off another wedding dress? How can you design a wedding dress by drawing all these details in to one perfect wedding dress? The next method is the one for you! The method about to be described will benefit you if you need to take your design to a wedding dress maker to have a unique custom made wedding gown created. The next technique is the tracing method which you can use to design a wedding dress. Learn about two options in which you can create your own wedding dress. If you have good sewing skills, have you considered making you wedding gown? Here are some pointers on how to design a wedding dress you will make yourself.